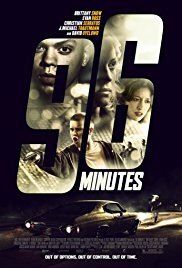 Inspired by true events, 96 minutes is the story of four young lives slammed together in one shocking moment. The events of the night in inner city Atlanta, Georgia, unfold in real time as we inter-cut between a carjacking and the beginning of that day, following four separate kids – who they are, where they come from, and the seemingly innocuous decisions that lead them towards a life changing conclusion. With no adults to guide them, they’re left on their own to try to survive not only this night, but the complex reality of the world they live in. A realistic look at the sometimes hopeless life for some in the U.S. It’s typically again a story of a boy out of the slums who WANTS to do it in another way, but through circumstances ends up on the wrong path again. The camera work didn’t bother me. It’s now standard that images have a twitch. It seems as if the cameraman constantly works with a hangover. It annoyed me lots of times in the past and eventually I have reconciled myself to it. The acting usually wasn’t that bad nor excellent. The various story lines with flashbacks interwoven throughout made it sometimes difficult to follow, but eventually all the pieces of the puzzle fitted. Not bad, but not top either.